About Us : Xcom Systems, Inc.
Paul Stroup is an Electrical Engineer who earned his degrees from Michigan Technological University and is the founder of Xcom-Systems Inc. Prior to his involvement in the marine electronics and electrical industry, Paul worked in the Wireless Telecommunications Industry in the design and construction of cellular networks around the world. Paul comes from a sailing family and sailed every summer weekend starting at about 5 months old (whether he liked or not). 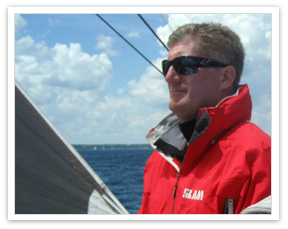 With time Paul developed a passion for sailboat racing and has competed in many sailing events around the world. When Paul moved back to America from Europe he resumed racing on Ken Meade’s various “Renegade” sailboats. As problems occurred with the various electronic and electrical systems it was Paul who the crew turned to in order to resolve the problems. As the word spread of Paul’s ability to solve complex electronic issues, his phone began to ring from other Captains and vessel owners. This demand for quality marine electronic service resulted in the incorporation of Xcom-Systems in 1999.